The Maldives is famous for its brilliant tropical weather. Temperatures sit at an average of 28°C (ranging between 24°C – 31°C) and the sea ranges between 26°C – 29°C. There are two distinct seasons in the Maldives. Depending on your motivation for travelling, both have their positives! The dry season, from November to April, is the peak tourist season. Enjoy 8 hours of sunshine a day and an average temperature of 25°C. 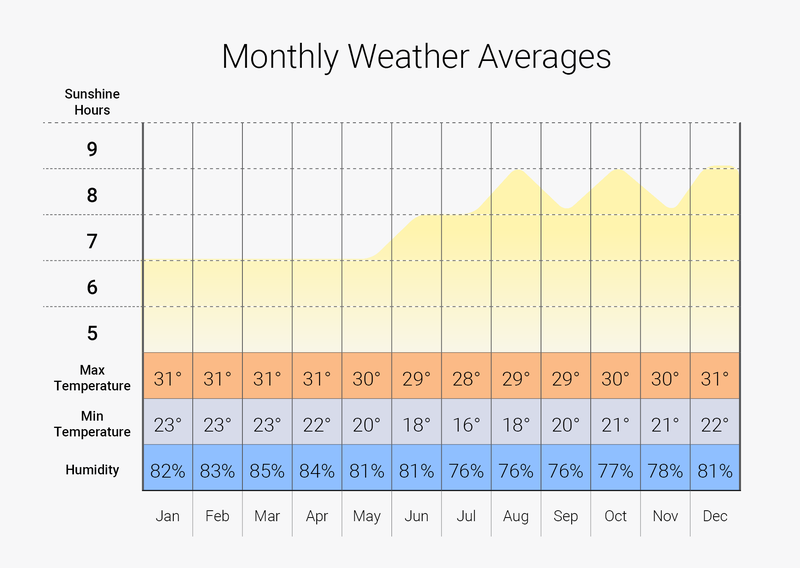 If you like your sun and uninterrupted blue skies, the driest time of the year is between January and March. The wet season typically lasts from May to October. While temperatures stay constant, June, July, and August are known for heavy rainfall, storms, and high winds. Conditions are perfect for surfers and sunshine does break through the showers! When choosing the best time to visit the Maldives, it’s best to think of your reasons for travelling there! Snorkelling and diving conditions are great all year round, although the lighter winds in the dry season do make for calmer seas and clearer visibility. The dry season also gives you more time to enjoy the outdoors—soak up the sunshine on your own private beach or paddle board across calm turquoise lagoons. In the wet season you can still enjoy warm tropical weather, though the diving visibility switches from being best on the east, to best on the west of the country. Waves are ideal for surfing in the wet season, plus resorts and airlines tend to offer better prices! Still not sure when to plan your Maldives holiday? Call our My Maldives Holiday Experts today for expert advice!